What is it about the 'Barbarossa bug'? 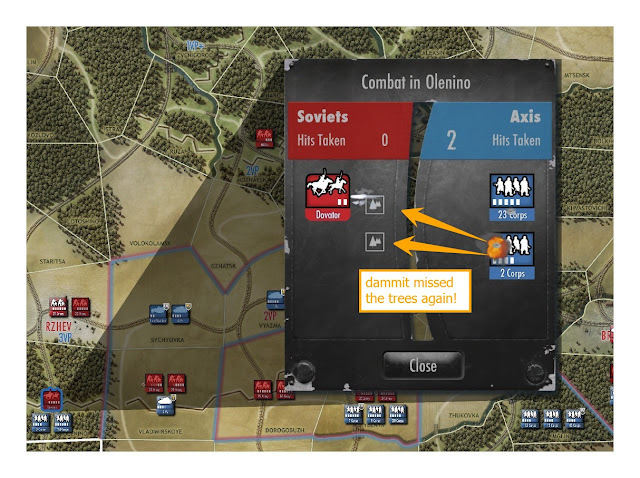 Wargamers seem to have an itch that can never be scratched when it comes to simulating moves and battles on the Eastern front in WW2. It seems there is enough on this subject; does the gaming world want to do with yet another battle across the plains and steppes of Russia? Yes, of course! The Eastern Front was and remains the mother of all battles that we have never seen the like since. In salutation of that truth, Shenandoah Studio and Slitherine) have demonstrated precisely how to please us. Ted Raicer's Drive on Moscow is a true gem and you are most encouraged to give it more than just a try and it's a good value to boot. 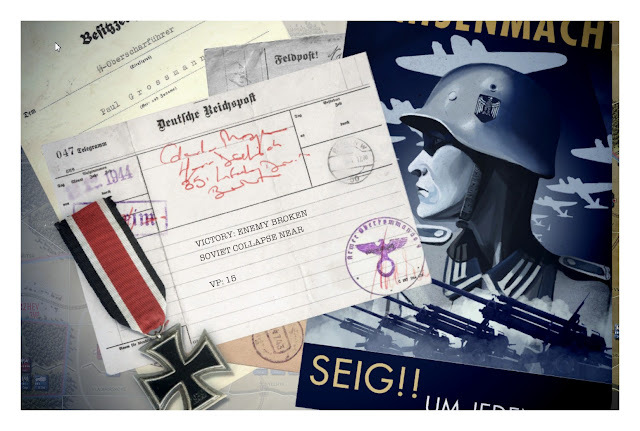 The studio has arranged game content to be about the exciting and volatile battles of maneuver and counter-attack that occurred during the final thrust to capture Moscow before the end of 1941. Yes, that means the game calendar skips over the initial stages of Barbarossa; nevertheless, players won't mind, because they will keenly experience the critical period from October to December, as the Germans recognized the urgency of defeating their foe before the depths of harsh winter arrive. On the other hand, the Russians thought they had a breather and hadn't expected a late season attack at their heart of the nation; thus, they are disorganized and unprepared for battle in the beginning. Massive initial attacks allow panzers to flow forward blazing; the landsers mop up thousands of isolated troops as they struggle to keep up with mechanized elements. Russian cavalry will nip at German supply lines. Indeed, over-extended German forces will run out of fuel and can immobilize at the worst time. A diminished Luftwaffe will still pin down Russian troops who can only find time to regroup when the Rasputitsa arrives, slowing the Wehrmacht to a crawl. But frosty weather is around the corner, allowing the Germans one final push through the forests surrounding Moscow! Then they better dig in, because with the deeps snow come the Siberians and Russian tank corps. 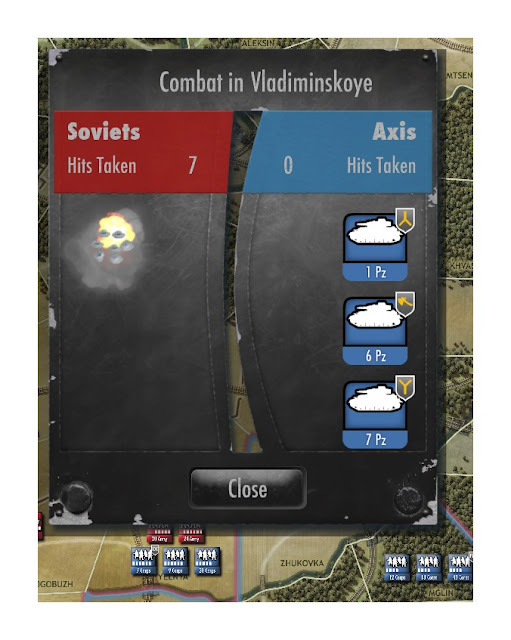 The experience of Drive on Moscow is truly engaging and the flavor of each campaign varies sufficiently from playing to playing. The AI is robust enough to be frustrating in early attempts, and other reviews have praised the PvP element. The author had to struggle through some personal biases while working on this review. I've a grognard attitude about board wargames but a casual attitude about computerized variety. What that means to me is that, for the latter, I don't have a need to look under the hood for underlying combat charts, realism rational movement tables, supply rules and so forth. 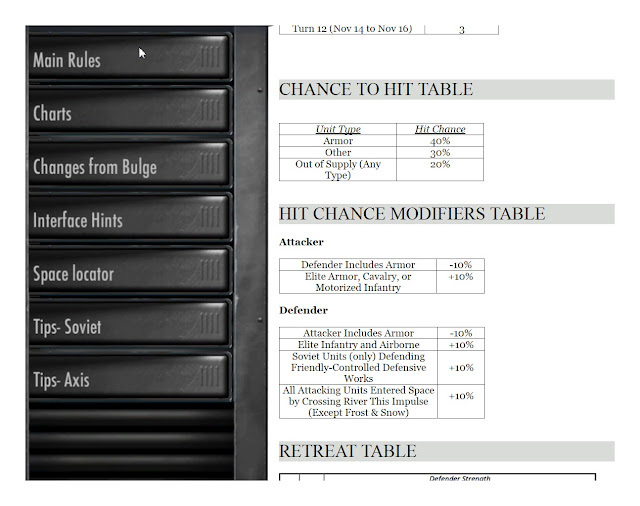 All of us know these make a wargame distinct from other games, but I figure I've done enough mastery of tomes like the Advanced Squad Leader rule book for board games -- let the computer handle that stuff. I find it necessary to share my biases to help the reader understand how and why I approached this review with some trepidation, exacerbating the fact that this is my first review for A Wargamer's Needful Things. So, let me get the negatives and biases off my chest; I'm sure some will recognize them within themselves, too. First, the author doesn't care for area movement in wargames. Hexes, give me hexes; I grew up on hexes and eat them for breakfast. I'm talking about Avalon Hill's Battle of the Bulge, Afrika Korps, Panzerblitz and the like, produced in 60s and 70s. Truth be told, this is exactly why I didn't go for Shenandoah's Battle of the Bulge when it came out last year (2015). I'll be purchasing that game now, you take it to the bank! hmm the areas of battle do not look digestible, Sir! Next, the impulse movement system felt strange at first. I grew up on IGO-UGO. But in this, players activate units in one area, moving/attacking into different area(s) and/or staying inside the one they start in. Once that area is activated, it's done, and so are any units that didn't (or forgot) to move. Now, there are many latter-era wargames that use this method, but I'd never felt comfortable about them (e.g. Breakout: Normandy). move these guys, too! (Unless you want them to camp for a few days). Finally, we all know rough terrain is going to have an adverse effect on combat, but in this game it's abstracted by being forced to blow up the cities or trees before inflicting damage. It's an okay mechanism as far as the outcomes, but I'm used to 'defense is doubled' or 'column shifts' for this sort of effect. However, for the casual gamer, it's just fine as far as simulating results, but my grognardish left-handed brain didn't want to wrap around this notion right away. 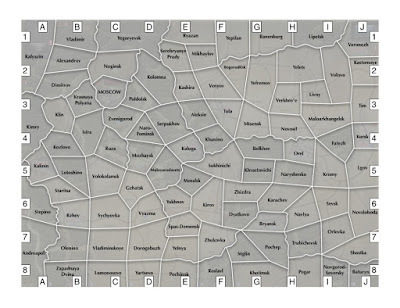 Shenandoah does a very good job making it easy to learn the game while providing a design that is not-so-easy to master. That's exactly what a casual player is looking for. Grognards who want to check out the systems and rationales can find them easily in the manual, so they can get that 'yep this is a wargame' feeling. You want charts? You got charts! Not only does the game come with a comprehensive and eye-pleasing on-line manual, but the in-game main menu allows options for a step-by-step tutorial or a basics of play summary (for those who don't want to read manuals nor suffer the pace of tutorials). 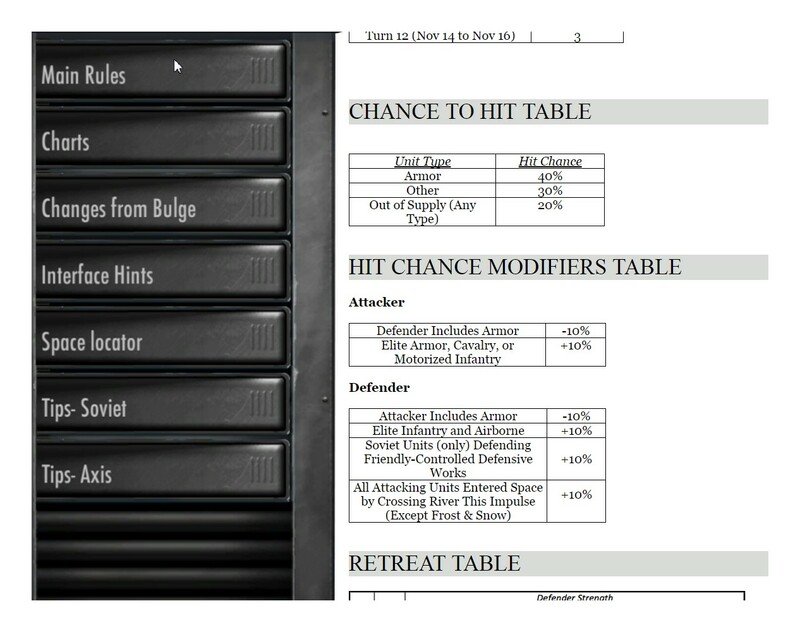 Gameplay effects of rules interactions are not described in entirety, which is a good thing, because it makes the game harder to master. During most calendar turns, players alternate impulses that can vary in length from 0-18 hours, depending on the weather. This time variability is a huge factor affecting outcomes in different replays of the same campaign. better fix this one, methinks! Note: impulses are confusingly called turns during gameplay, which is absolutely not helpful in learning the game, even if the manual gets it right. Calendar turns during 'offensive' weather last for 72 hours and 120 hours in 'nasty' weather. This does seem counter-intuitive until one realizes that movement in bad weather is often significantly restricted, particularly for the Germans. It should be mentioned that the online manual is comprehensive and easy to read and includes tips of play. The UI is very easy to use and highly informative about game play and events. It's better than many I have seen out there and is especially kind to the eyes of older gamers. However, there are a couple of minor design factors that may need to be addressed. First, I would have to say that an aesthetically appealing and informative interface is just fine, but the menu screen is overly large. For example, when you hit the 'supply' option on the menu, you'll be forced to drag the map around to see what's underneath. Making this menu smaller in size would render this unnecessary. We've all seen these PC games with miniaturized heads-up displays causing bloodshot and eye-strained squinting... but... I really don't need to see this UI from across the room. The other minor gripe with the UI is this small panel in the corner. As you can see, this includes the the redo button (top) and the menu button (bottom). Yes, the redo button is fantastic and essential because you can test all your moves to get an idea of success probabilities -- an absolute necessity to have at your fingertips. Likewise the menu button. Unfortunately, the designers have inexplicably made it impossible to minimize or turn off this panel. 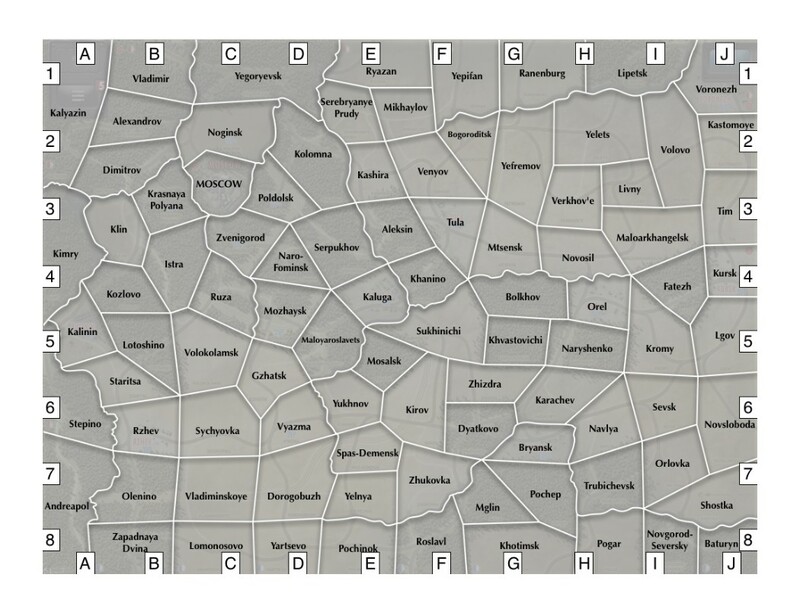 As a result, it's often blocking units/areas hidden underneath, particularly the top left zone of the map. This UI can't be minimized and is glued opaquely over the map corner. The get-around is to play with the zoom until you can see the units underneath. The last glitch (not pictured) with UI involves not being able to see all the zones on the left side of the map when applying reinforcements or air interdiction. That's very annoying if you want to do something over there in either of those phases. It's possible to manipulate visibility, I think, by zooming in and out, varying the resolution or changing from windowed to full-screen, but that shouldn't be necessary to manipulate. The graphics of the maps, units and animations are quite pleasing. The map changes in hue and color for different weather conditions such as clear, mud, frost and snow. Battle animations create tension; it's very well-designed. I can use 640 x 480 up to 1920 x 1080 resolutions. One of the reasons I play more computer games is that gamers in SE England seem to love all sorts of miniatures games rather than my favorite board games. Solitaire is okay, but not great for some games at all. Computer games with good AI are a substitute for real-life competition. However, we all know that many games come with atrocious AI. Honestly, Stephen Hawking can say what he wants about robots taking over, but I don't see that happening with some of the AI evident in these computer games. 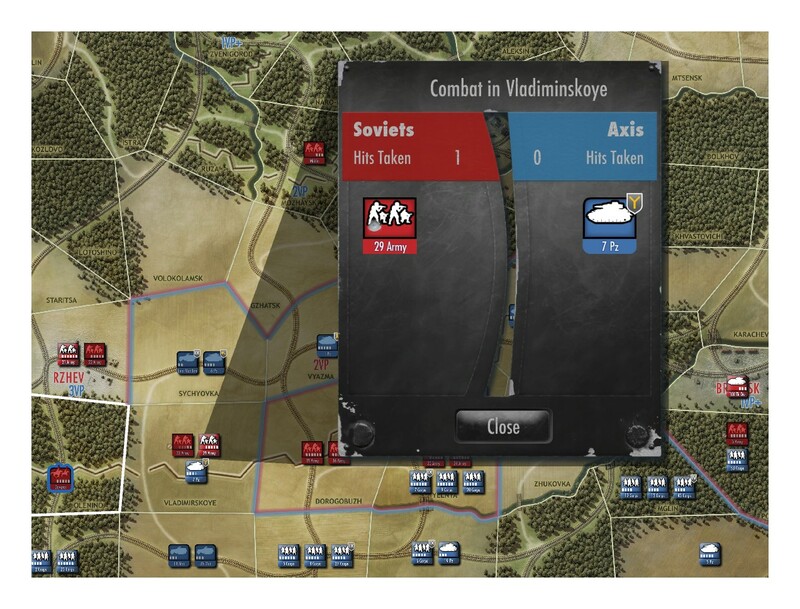 Drive on Moscow's AI is very adequate to learn the game and to get up to speed on how the various play elements work together. It took me a while to realize that the AI likes to nip at supply lines; keeping them open makes all the difference in (especially the German) offensives. AI Zhukov tries to cut the lines. Note the cav unit pinned down by air interdiction (outline in blue). 1) As previously mentioned, once an area is activated, all units within are considered to have activated. Use them or you'll lose them for the calendar turn. Trust me, you'll want that firepower as far forward as possible and the AI will know you left them behind. 2) Cut off supplies. Being out of supply puts enemy units dead in the water and unable to defend as time goes on. The AI is somewhat spotty about securing supply lines as time goes on. 3) Players can activate units in the rear to reinforce an existing battle; doing so will also activate any units in that area that are yet to be activated. This is a good way to keep up the momentum as units get strung out making sure supply lines are safe. The AI taught me this trick. After I kept losing Operation Typhoon to Konev, I watched the AI play as Halder, and learned alot. 4) The Germans do need to make a robust try at Kursk and Voronezh by calendar turn three. 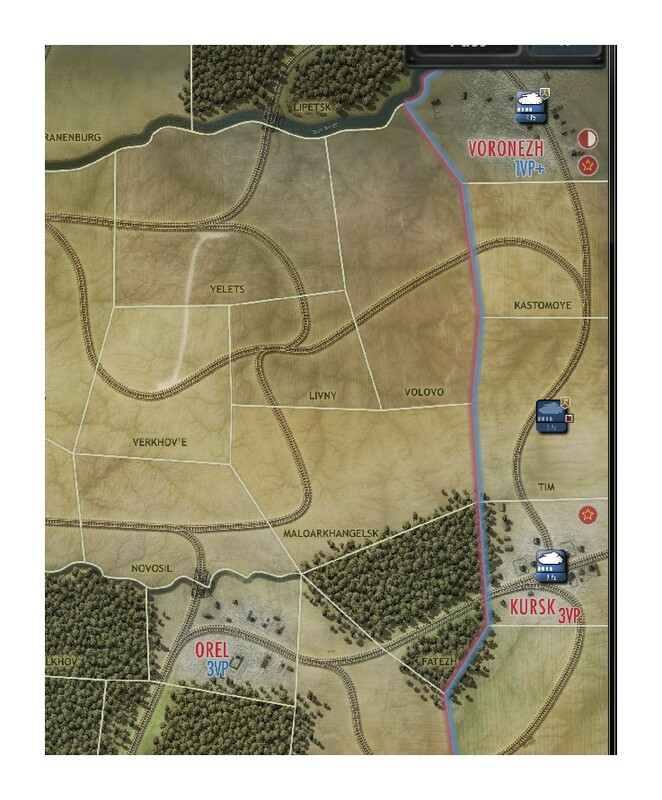 Keep in mind that the German flank on the south is 100% secure once these are taken (unlike the northern sector). Seizing these two cities prevents the Russians from placing reinforcements in them. It will feel like your Panzer corps are floating in outer space up there, but the AI has no good way of taking these cities back. Kursk is a must, and Voronezh is not far behind because of the +1 VP you get per turn. You won't get Bryansk as quickly, but the security you'll get in the south is worth it. Finally, by using the Turn 3 prepared offensive, Voronezh falls. be taken but the Russians are too busy elsewhere to defend it at the moment. 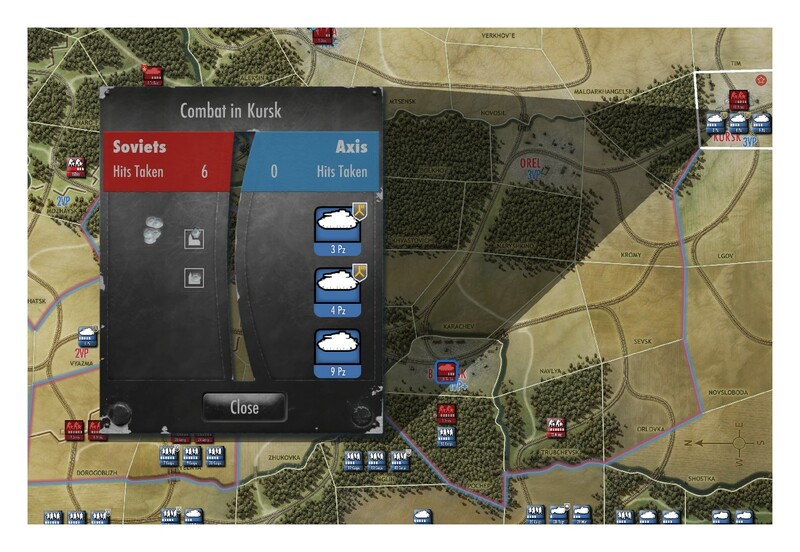 5) Look for chances to take Moscow, especially during your October offensive. Often the AI under-defends the capital. if you can make a breakthrough, you can march into the city for an instant win! You'll have fun with this, especially for casual players. You'll know the nuts and bolts of the game are sound. You'll cheer with joy at crushing wins and moan when the dice fail you in defeat. Sometimes the panzers will roll over hill and dale, crushing Russians left and right on the fast track to Moscow. 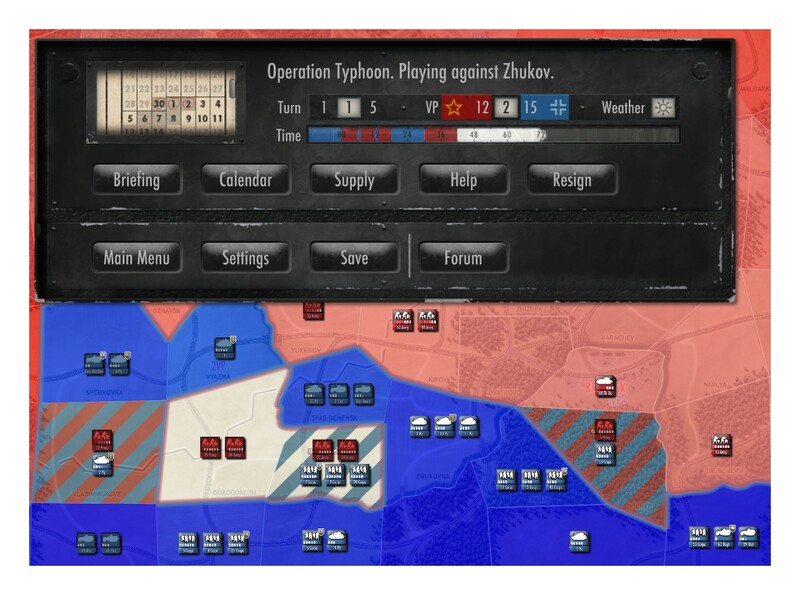 German tank commanders will especially enjoy blowing holes with the free offensives on turns 1-3 and 11. But watch out! Suddenly the AI will order a Militia unit into the open and somehow it will shoot your Panzer corps right up and into the dead pool (say what?!). Nothing is certain, just probable. 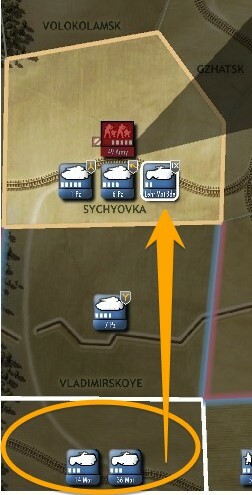 Watch out for those Russian cavalry units, they are tough. And yes, the Germans cannot afford elimination -- each unit counts as a VP for mother Russia. You'll probably start as the German player because who doesn't want to do that, right? But hear me, you'll want to play the Russians very quickly; the AI will show you tactics needed to be successful in the game (especially for Operation Typhoon, which is hard enough to win as the Germans). Don't be daunted if it seems like Typhoon is impossible for the Axis. It's not -- but it will take a few tries! The Voronezh gambit is finally what put me over the top. But the game on full campaign mode seems more satisfying. Truth be told, I didn't try the two 'middle' scenarios before writing this review. I'm sure they are worth a shot, too. This badge on Steam is not so easy to get. In conclusion, casual players are likely to be more than satisfied and happy with this game. The technical backbone has enough crunch to satisfy grognards too, although those who are looking for deep detailed game structure will probably pass. I've yet to try PvP but other reviewers find it quite satisfying. I know a guy who loves area board games -- I'll see if he wants to give it a go. Enjoy! Marc Hanna. Congrats on your first review for the team. Really, really enjoyed it. I have what I assume is a scaled down version for the I-pad, as it doesn't seem to have some of the features you've mentioned. Love the game a lot especially as I'm as happily at home with area movement as hexes. Look forward to more from you. Thanks very much Mike! Didn't know it was scaled down on the other platform.